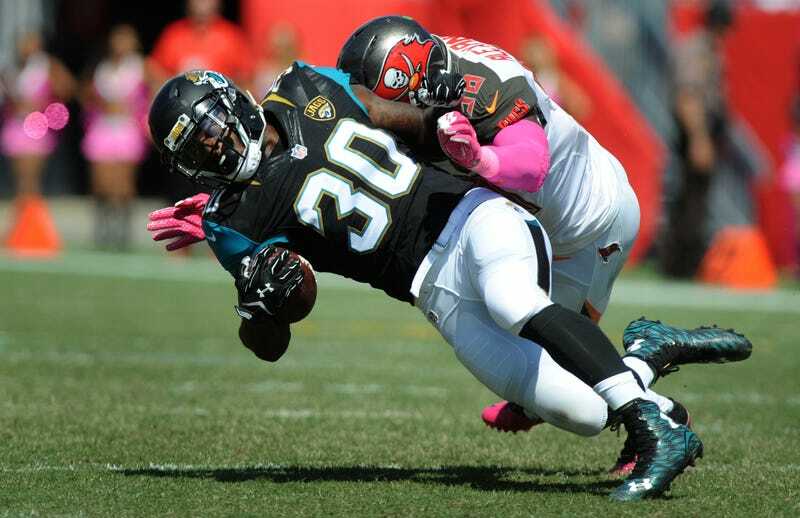 Jacksonville Jaguars running back Bernard Pierce made a bit of news after his team’s game on Sunday against the Tampa Bay Buccaneers, wherein he blocked for the other team during a second-quarter kickoff. It was a funny, surprising little brain fart that became even funnier after the game when Pierce couldn’t come up with an explanation for it. We might have an answer now. According to Big Cat Country, Jags head coach Gus Bradley addressed the play in a Monday press conference. Bradley was frank when asked directly if the concussion that Pierce possibly suffered sometime before the kickoff contributed to the running back’s confusion. If Bradley’s correct, and Pierce got lost on the field because he was so concussed that he just didn’t know where he was, then what was funny yesterday is now actually pretty terrifying.